Pocock evokes powerful imagery of the viciousness of war in both the desert and the jungle as well as convincingly portraying how men respond under enormous stress. Reece Pocock is from Adelaide, South Australia. He writes crime/thrillers, historical fiction, children’s stories, short stories, personal development books, screenplays and stage plays. Reece had about sixty articles published in, TheCheers online magazine. This website also published twelve of Reece’s short stories. Two short stories, The Girl in the Red Beret, and What a Dirty Little Town was included in an anthology—The Killing Words—published by Crime-writers SA. Reece won the City of Burnside Library crime short story contest, with his story, The Girl in the Red Beret. His screenplay, The Soldiers, adapted from his novel of the same name, was highly commended in the Di Cranston award administered by the Fellowship of Australian Writers. The Ned Kelly writing award long listed, Murder on Display and The Politics of Murder. Reece’s first crime novel, Murder on Display, was published by Custom Book Publications in November 2012 and the same publisher published his second novel the Politics of Murder in September 2014. He has self-published Evil in the City, a book of crime short stories, Love and War, war-related short stories. Melissa Lane, girl detective a children’s story about missing lunch money, Sarah Loves ice cream a children’s story about a girl’s obsession with ice cream, How to achieve High Self-esteem, a self-improvement book. 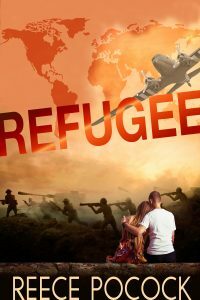 Refugee, a historical family Saga. He also writes articles, mainly for business. Reece Pocock loves to read and after many years discovered he could write. He has published crime, children, history, short stories. He has also written screenplays and plays receiving an award for a screenplay. He lives with his wife and enjoys his family especially his three beautiful granddaughters.